Drosera rotundifolia, the round-leaved sundew, is one of several insectivorous plants that live in our area. It is the more common of our two native sundews, the other being D. intermedia, the spatulate-leaved sundew. As the common names indicate, the leaves of D. rotundifolia are round while those of D. intermedia are more oval, or spoon-shaped. Both belong to the family Droseraceae. Although D. rotundifolia is common in our area, many have never seen it. It is a tiny plant whose leaves are only 1/2" long and it often grows mixed in with sphagnum moss. When enough plants congregate, the bright red color often reveals its presence. I've seen it in bogs, on hummocks in fens and growing in a wet area right along the side of Route 11 in Tully, NY. Drosera intermedia is much more scare. I've only seen it once in a bog near Whitney Point. Both of these species are protected plants in New York State, classified as EV (Exploitably Vulnerable). 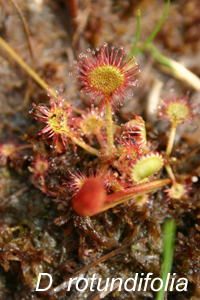 The sundews thrive in environments where other plants cannot compete. Under conditions that lack the nitrogen and phosphorous that plants need, or low PH that prevents plants from utilizing the available nutrients, sundews compensate by capturing insects and obtaining the needed nutrients directly from the insect bodies. The plant morphology efficiently supports this lifestyle. The leaves form a rosette which lies nearly on the ground, exposing its upper leaf surface. The surface is covered with red tentacle-like hairs that exude a sticky, sweet, substance that attracts insects. When an insect lands on a leaf, the mucilage helps to hold the insect while the leaf secretes proteolytic enzymes that digest the insect, releasing nutrients that are absorbed by the leaf surface. 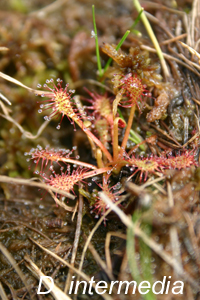 Unlike the well known Venus Flytrap, Dionaea spp., Drosera does not snap its leaf shut on a captive, but its sticky tentacles slowly move to increase the amount of surface contact with its prey. In July and August the sundew blossoms, producing a raceme with up to fifteen white or pink flowers, all growing on one side. The stalk is leafless and can be 2" to 14" long. Each flower has 5 petals and 5 sepals. Drosera have medicinal properties and are used today in hundreds of registered medications to treat respiratory ailments such as asthma. Native sundews are protected in nearly all countries in the world, so they must be raised commercially for the pharmaceutical industry. Drosera rotundifolia and D. intermedia are fast-growing members of the genus, and thus are two of several Drosera species commercially grown.